Residents of Broward County are being offered free Prescription Discount Cards that offer an average 24 percent saving on the retail price of prescription drugs. Nine out of 10 pharmacies accept the card, which also can be used for some pet medications. The cards may be used by all residents regardless of age, income or existing health coverage. They are good for people who have no health insurance, and for people who do have insurance for prescriptions not covered by their particular plan. 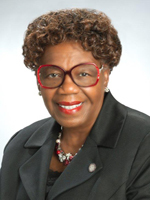 The cards are part of a $400 million program including 1,400 counties, provided free of charge by the counties in partnership with the National Association of Counties. It is administered by CVS Caremark. The cards can be picked up at County commission offices and County library branches, or printed from the Internet at www.caremark.com/naco. Residents can find the nearest participating pharmacy on the website or at 877-321-2652. We ask all Floridians become familiar with our outreach initiative Gather Go Get by visiting www.GatherGoGet.com, in English, www.ReunaVengaObtenga.com in Spanish, and www.RasanbleAlePran.com in Creole. The State of Florida is issuing REAL ID compliant driver licenses and identifications and we need the public to be aware of the documentation requirements in place. We need you to help in informing all customers in order serve them the first time they visit one of our offices and avoid return customers due to lack of documentation. The links above are the best source of personalized information about the documents to bring to one of our offices when renewing or replacing a driver license or identification card. We appreciate your help in making the information available to people in your organizations and other individuals. It will help us serve our customers better. Broward County is offering the ENERGY SENSE Appliance Rebate Program to County residents and small to medium-sized businesses to encourage replacement of an old appliance with a new more energy efficient appliance. Up to $400,000 is available in rebates to eligible participants. The County expects 1,200 to 2,000 rebates to be issued to residents and 100 to 450 rebates to businesses. For More information regarding eligible ENERGY STAR appliance rebates for residents and businesses. 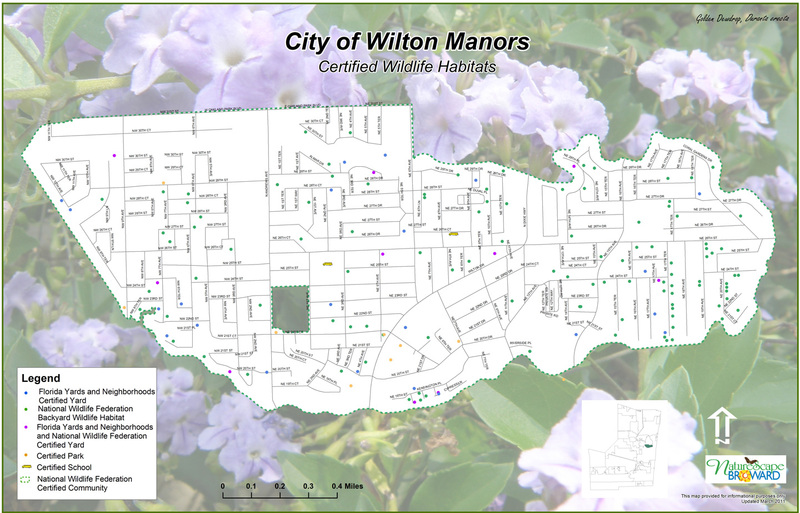 The City of Wilton Manors has been awarded the annual Naturescape Emerald Award under the Government/School/Municipality category by Broward County. This award recognizes the City of Wilton Manors for its many outstanding efforts which have emphasized the preservation and enhancement of our environment and natural resources as well as involving and educating our residents. Became the 17th City in the nation to be declared a Certified Community Wildlife Habitat by the National Wildlife Federation. 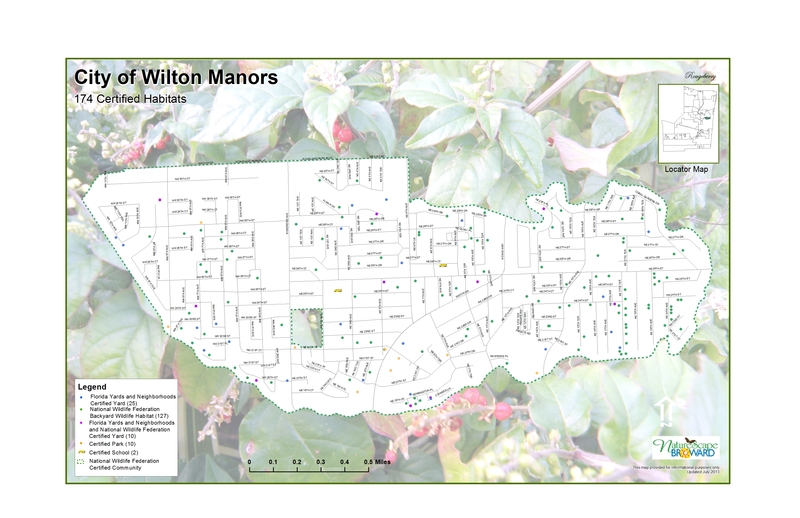 Completed a detailed computerized tree inventory for all City owned properties through a N ational Urban Forestry Grant. Removed exotic, invasive plant species at Richardson Historic Park and Nature Preserve through a $106,000 grant from Broward County. Planted 32 canopy trees at Rachael Richardson Park. Relocated 22 mature Royal Palms for new City Hall construction. Planted 20 native trees in City parks received from developers as mitigation requirements. Planted 85 trees in City Parks and 178 trees on City swales provided from the Broward County Tree Trust Fund. We are now accepting requests from homeowners to plant additional trees in swales as Phase 3 of this project.Seven Leisure Department staff members have received training as Habitat Stewards. Developed M.E. Depalma Park which includes over 100 native plant species on the site. Fire-Rescue personnel - ALL AT NO CHARGE. As a volunteer CERT member, you will learn life-saving skills for major emergencies including hurricanes, floods, and/or fires. You will also learn fire suppression and injury care for everyday situations. As a CERT graduate, your skills will be valuable to you, your family and your community in the event of a major disaster. 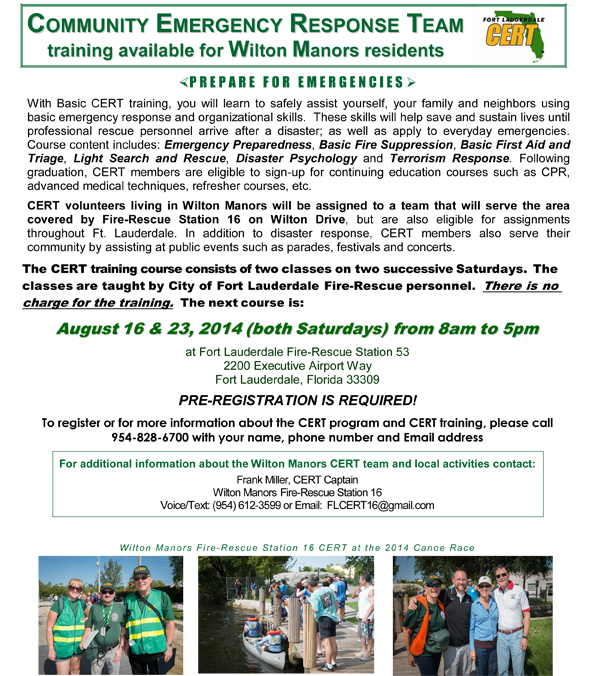 CERT members may be assigned to a team in their neighborhood where they will play an important community safety role, as well as assist Fire-Rescue professionals in the event of an emergency. 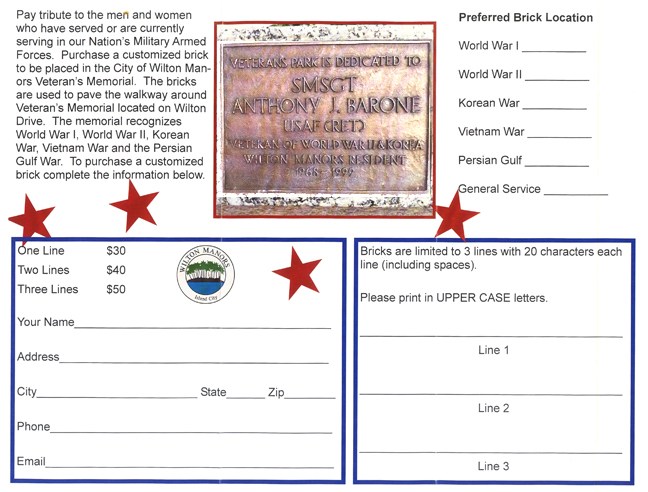 Honor your Vet with a Brick! The Wilton Manors Leisure Services Department reserves the right to refuse orders of questionable taste. You can now have two (2) emergency contacts attached to your FLORIDA driver's license. How does that help you? - If you are in an accident an officer could run your driver's license and view the 2 names you selected eliminating the need to search for relatives. Go to www.hsmv.state.fl.us and click on "Emergency Contacts", type in your driver's license number and date of birth. You will be directed to type in name, address and phone numbers of two people you want to have contacted. Hit the SAVE button and you are DONE. No further action is necessary. view a larger copy of the map featuring the cities certified habitats.